A classic and festive vegetarian dish made easy. The vegetable stew is great tasting, very flexible, and quite practical for home cooking on a daily basis. This is a very long post with detailed instructions on how to create your own version of Buddha’s Delight. You can go to the recipe directly and start cooking. Buddha’s Delight (罗汉斋) is also called lo han jai in Cantonese and luo han zhai in Mandarin. 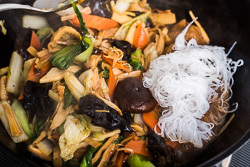 Jai or Zhai literally means the Buddhist cuisine, which is basically a vegetarian diet that uses very simple seasonings and minimal oil. 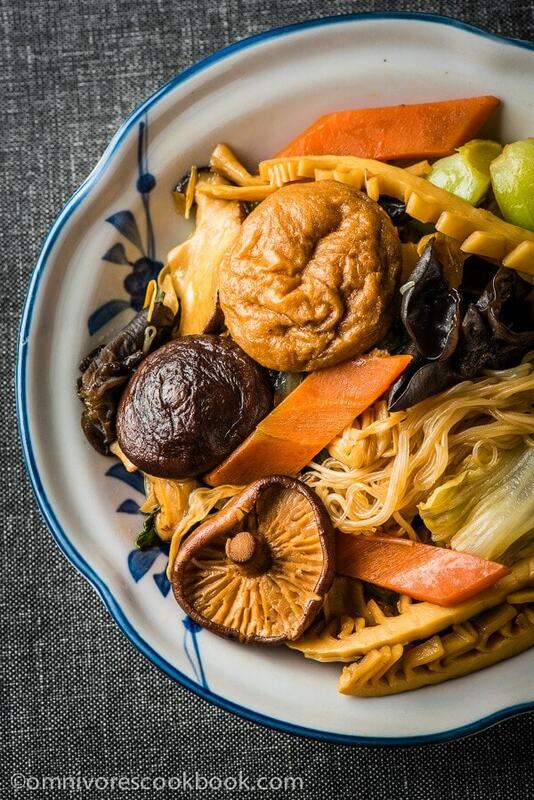 Among all the Jai dishes served in temples, Buddha’s Delight is the most famous, and is even well-known outside of China. It is said the unabridged version of Buddha’s Delight contains 18 vegetables, or even more. However, for family cooking, people usually use fewer ingredients. 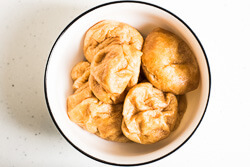 In southern China, there is a tradition to serve this dish on the first day of the Chinese New Year. One theory says it’s derived from Buddhist practice and represents self-purification. Some people believe it brings good luck. And some say it’s great for digestion, after eating tons of meat and protein on New Year’s Eve. 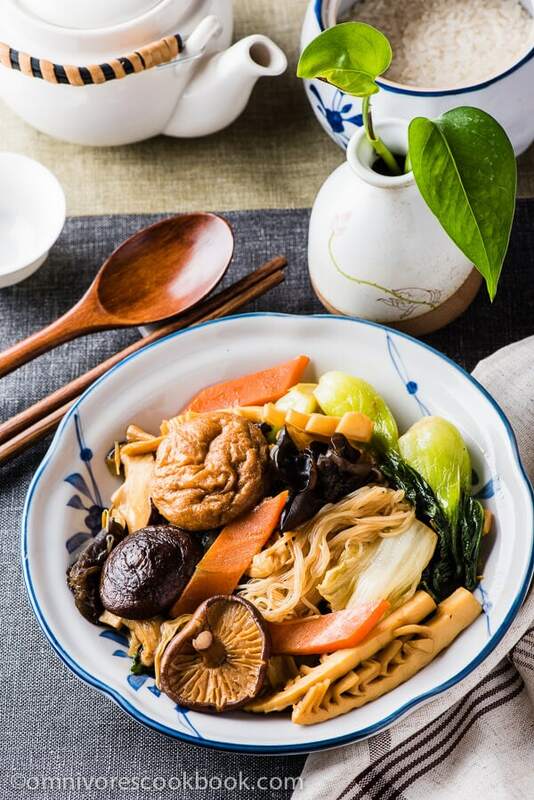 In northern China, we don’t call this dish Buddha’s Delight, but we enjoy cooking a vegetarian stew that uses very similar ingredients and seasonings. When a reader requested this recipe (Thanks, Linda, for sharing this idea! :)), I did some search on the original version. From there, I developed this recipe, incorporating some of the cooking techniques that my mom uses into the original. 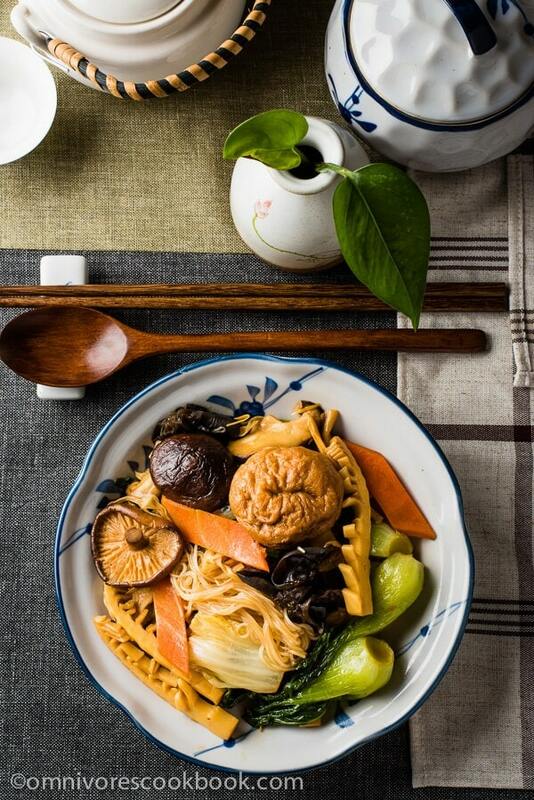 Here is my northern style Buddha’s Delight – a delicious, comforting, and healthy way to enjoy various vegetables. 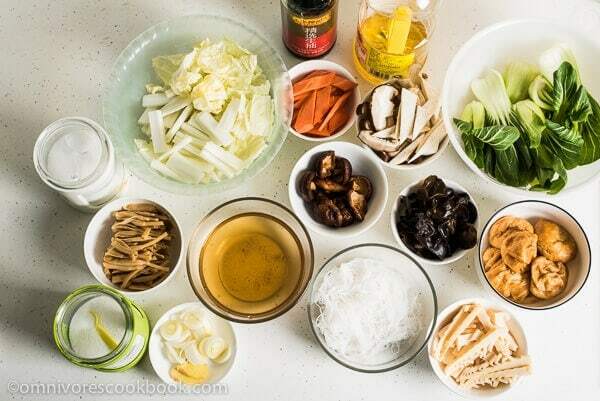 The combinations of ingredients that can be used to make Buddha’s Delight are countless. If you look at the list given on Wikipedia, there are 34 commonly used ingredients and 11 seasonings. Among them, a few of the items are not even vegetarian. The version I cooked today is vegetarian. I chose the vegetables below, because I wanted to create a dish that is great in taste, good in appearance, and relatively easy to cook. Why is it “relatively” easy? If you check the recipe for the complete version, you’ll find that cooking this dish is extremely time consuming, because you need to prepare so many different kinds of vegetables and cook each one separately. It’s the kind of dish that you would only cook once a year. After a few modifications and adjustments to the ingredient list, I created this version. This recipe is very flexible and quite practical for home cooking on a daily basis. 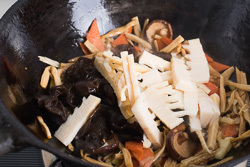 In this dish, the ingredients can be generally separated into 3 groups. When you understand the difference between the 3 groups, you can create the combination of this dish depends on what do you have at hands. (1) Group A is a must. You can use any of them, but I recommend you choose at least two. 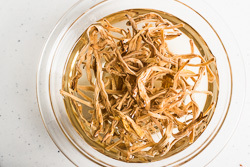 When rehydrating dried lily flowers and dried shiitake mushrooms, the re-hydrating liquid will become a perfect vegetable broth. It’s very strong in flavor and has a special aroma. 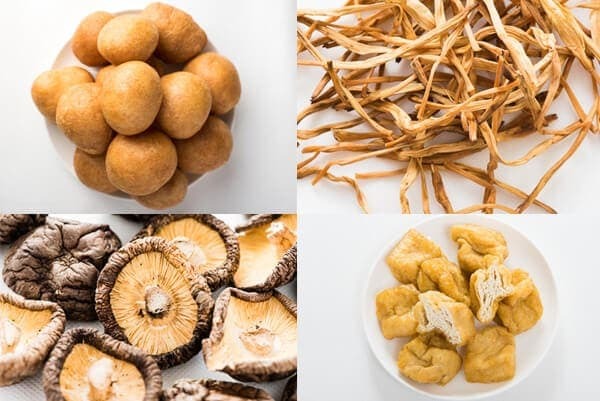 Use at least one of them (although I strongly recommended dried lily flower, because it has a very special and strong aroma), and doing so will eliminate the need to use vegetable / mushroom stock. Deep fried tofu and fried wheat gluten balls are quite greasy and very delicious. They add extra fat to the dish and make the rest of the ingredients tastier. 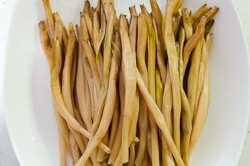 They also absorb flavor very well, and almost taste like meat once cooked (we call them vegan meat in Chinese cooking). By using them, the dish will become more fulfilling. I suggest choosing at least one of them. Because they are delicious and add great texture. In this recipe, I used six items from group B. But you can use just two or three, to make the dish simple and tasty. 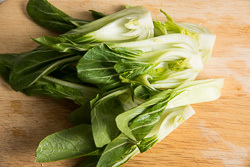 I suggest you choose at least one of: bok choy and napa cabbage. They add liquid to the dish and make the dish moist and comforting. The rest of the items are all optional. 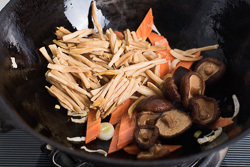 Bamboo shoots and water chestnuts add crispness. 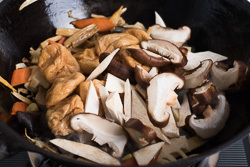 Mushrooms add meaty texture and umami. Dried tofu sticks add a firm and meaty texture. 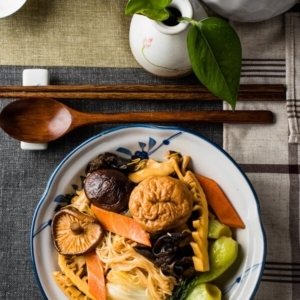 In this recipe I added them at the end to absorb the broth, so the finished dish wouldn’t be so watery and the noodles would be full of flavor. If you don’t use bean threads, you could choose to add cornstarch water to thicken the broth. You can use the ratio: 1 teaspoon cornstarch : 1 tablespoon water. Whisk the cornstarch water to dissolve the cornstarch and slowly swirl it into the stew at the end of cooking (you can start by adding 1 tablespoon of the mixture). Stir to mix well and see whether the broth is thick enough. You can add more until the broth is thickened. You can use carrots or snow peas to add color, but you can also skip group C entirely. These items are added in order to add nutrition to the dish, but they don’t absorb flavor very well. If you decide to add them, keep the amount small (much less than the items from group B). 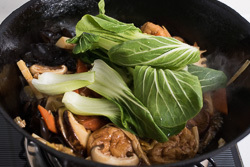 By the way, I used a lot of ingredients in this recipe and it almost filled a 14-inch wok. You should be careful not to exceed the total volume of veggies given in this recipe. (1) You will need some time to get the ingredients prepared. Pay attention some of the items that need time to rehydrate (marked as * in the chart above). (2) Infuse oil with fresh ginger and green onion (very important). (3) Stir fry the items according to texture. Add ingredients by the order of time needed to cook through. 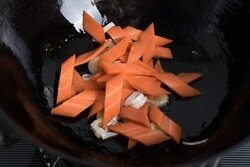 (4) Season with light soy sauce to add flavor, dark soy sauce to add color, and sugar (optional). 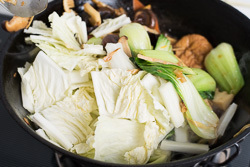 (5) Add vegetable stock (or re-hydrating liquid) and cover, to steam until cooked through (but not too mushy). (6) Adjust the flavor by adding salt. 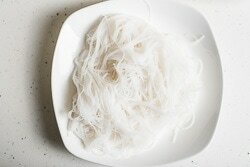 (7) Thicken the broth by adding bean thread noodles or cornstarch water. (8) Drizzle some sesame oil to enhance flavor (optional). Sound easy enough? OK, let’s get cooking! If you cook this recipe or create your own version of Buddha’s Delight, don’t forget to take a picture and post on my Facebook fan page. I love to see your photos! The prep time includes marinating time. If you are creating your own version of Buddha’s Delight, please refer to the notes in the post above. Be careful, when you pick your own ingredients, try not to exceed the total volume of veggies given in this recipe. Rinse dried lily flowers with tap water. Place in a medium sized bowl and pour boiling water on top. Mix well and let rehydrate for 2 hours (up to overnight). After 1 hour, mix the lily flowers again, to make sure all flowers are soaked in water. After lily flowers turn soft, snip the tough ends by hand, and cut in half lengthwise. Drain and set aside. Save the re-hydrating water for later use. 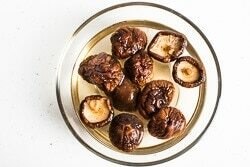 Rinse shiitake mushrooms with tap water. Add to a small bowl and cover with tap water. Let sit for 2 hours, until the mushrooms turn soft. 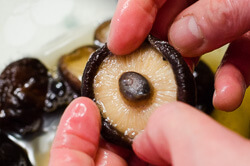 Gently squeeze the water from the mushrooms and transfer them to a plate. Save the re-hydrating water for later use. 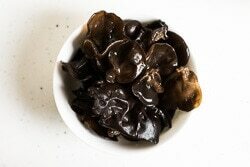 Add dried wood ear mushroom in a small bowl and warm water to cover. Let sit for 2 hours, until the wood ear mushrooms turn soft. Gently rinse with tap water and drain. Cut into bite size. 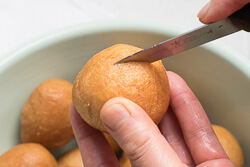 Use a knife to slice each fried gluten ball, so it absorbs water faster. Place all the gluten balls in a large bowl and add water to cover. 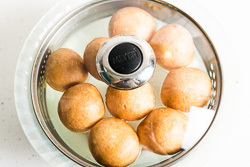 Place a cover (or a plate) on top of the bowl, so the gluten balls will be submerged in water. 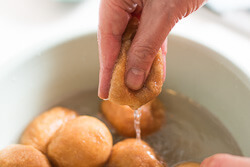 After 20 minutes, stir and mix with water again, to make sure all the gluten balls are soaked in water. After all the balls turn soft, squeeze water out and set aside. Discard the soaking water. Chop vegetables and prepare the seasonings. 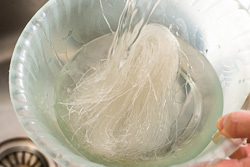 Place bean threads noodles in a bowl and add warm water to cover. Let sit for 5 minutes, until the noodles turn soft. Drain and set aside. 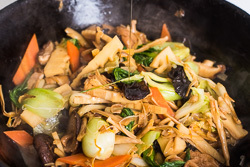 Heat oil in a wok over medium high heat (or high heat on an electric stove). When oil is warm, add ginger and green onion. Stir a few times until fragrant. Add carrot. Stir and cook for 1 minute. Add lily flowers and dried shiitake mushrooms. Stir and cook for 1 minute. 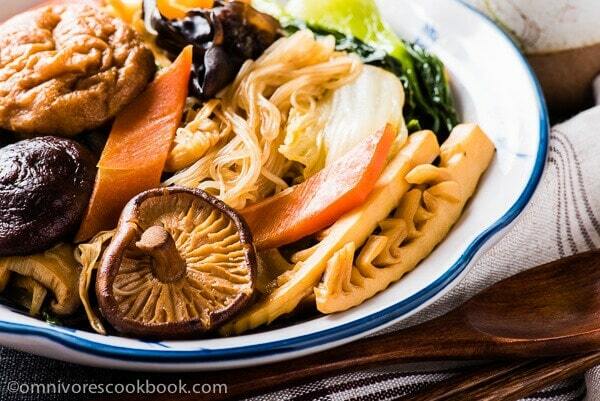 Add bamboo shoots and wood ear mushrooms. Stir and cook for 1 minute. Add fried gluten balls and fresh mushrooms. Stir and cook for 1 minute. Add light soy sauce, dark soy sauce, and sugar. Stir to mix well. 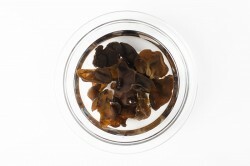 Pour about 1 cup of re-hydrating water from the lily flowers and dried mushrooms (or alternatively, vegetable stock). Add bok choy and stir a few times. 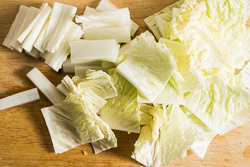 Add napa cabbage. Stir to mix a few times. Cover and let cook over medium heat for 3 to 5 minutes, until the vegetables are cooked through. Add salt and mix well. Taste the vegetable and add more salt to adjust seasoning if necessary. Add bean thread noodles and let them soak in the liquid. Stir and cook for another 30 seconds until the liquid is almost absorbed (or alternatively, use cornstarch water to thicken sauce – more information in the post above). Stop heat. Drizzle with sesame oil and stir to mix well. 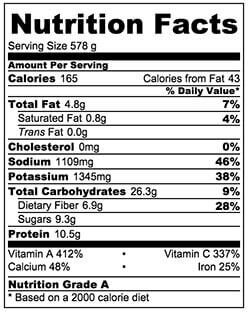 The nutrition facts are calculated based on 1 of the 8 servings generated by this recipe (it doesn’t contain the dried lily flowers and bean thread noodles due to lack of information). Maggie!!! WOW! now, this is a post!!! I love how you separated the ingredients into 3 groups: for texture, flavor and color!!! love this!!! and can’t wait to try this buddhas delight. . I love this!!! Whoa, Maggie, this is awesome. So informative and detailed. Thank you so much for your hard work! Maggie you have totally exceeded all my expectations here! Wow what an incredible dish.. I can only imagine how flavoursome it must be. I definitely will be getting my hands on all of the ingredients in group A, B and C – so I can try it out for my vegetarian family! Maggie this is such a beautiful dish and your step by step instructions laid out into 3 categories was extremely helpful. I don’t think I have ever tried Buddhas delight before. I love the texture of wood ear mushrooms and can’t wait to give this a try. Sharing, of course!!! This is an absolutely epic dish, Maggie! 18 veggies in one dish … wow, I’m into that idea! I love the info you’ve given us here about choosing veggies from the different groups – fascinating! Mmm… I love Buddhas Delight, but I’ve never seen one as wonderful as this! You’re recipe has such a wonderful variety of ingredients and flavors – brilliant! You blow me away with the depth of your posts Maggie! You are truly amazing. And this dish makes me soooo hungry! I came across your recipe because I was hungry for Buddha’s delight. After I saw your recipe, I realized that I had another one. But yours was really good. I like the lilies and mushrooms so this was great. My Great Grandmother use to cook this for me as an afternoon snack when I was young. She would leave out the leafy greens and have a plastic container sitting in the fridge for 3 days. 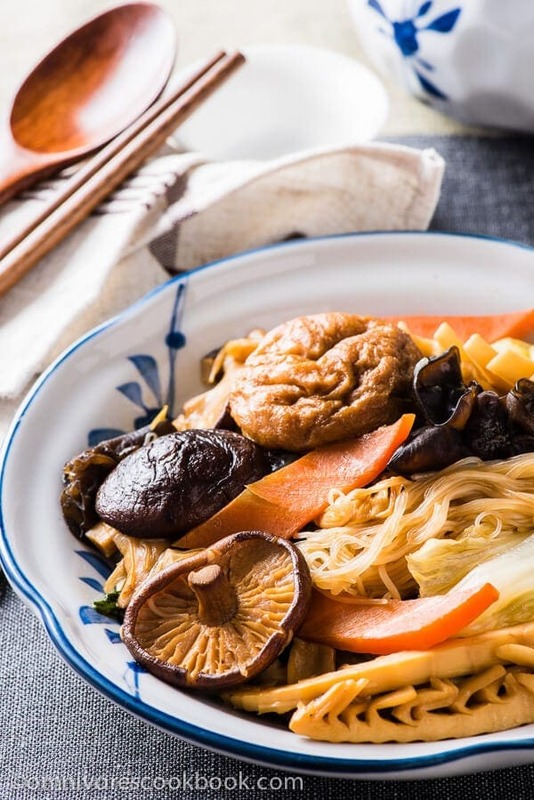 I use to marvel at the different fungi and textures when she served this on rice, rice noodles, egg noddles or on its own, it is a dish so wonderfully versatile and delicious. I wish I could tell her how much I loved her and her cooking, but we did not share a common language, apart from me licking my lips with a huge smile. I am going to recreate this meal out of respect and nostalgic selfishness. Thank so much for sharing the recipe with us. Great recipe. 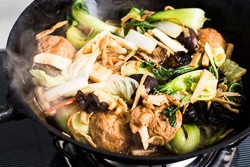 You can also add a piece of red bean curd to the seasoning to make the dish even more flavorful. If I want to use Tamari soy sauce instead of Dark soy sauce, do you think it will affect the taste drastically? I am using all your ingredients and seasoning ! Not at all! 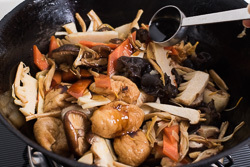 The dark soy sauce is used to add a dark color to the dish. Use tamari will end up with a lighter color but it won’t affect the taste. Happy cooking!